Every time you wash your hair, it is important that you condition your hair. It is equally important that you do it the right way. Sometimes you may be over conditioning your hair. As you know, too much of anything is not good. So, avoid using too much of conditioner on your hair. What Does a Conditioner Do Actually? You use a conditioner to protect your hair and to provide your hair some nourishment=net as well as moisture. A conditioner creates a layer on the hair shaft. It nourishes your hair and keeps your hair well hydrated. It is this layer formed by the conditioner that gives your hair shine and texture. This way it keeps your hair looking healthy and in good condition. Every time you apply the conditioner after you shampoo your hair, a layer of the product build is formed on your hair. As this layer builds up gradually, the hair’s ability to react to other products get reduced. As a result, next time when you apply oil in your hair or use new product, your hair will not react the way you want it to. This is because already many layers of the conditioner are formed and this product is deposited on these layers. This makes the product unable to reach the hair shafts. What you understand from this is that excessive use of conditioner can lead to the formation of a layer on the hair. This is so much that other hair care products that you use on your hair are unable to reach the hair. Signs your Hair is Over Conditioned? Your hair will feel limp. When you over condition your hair, it adds more than the required amount of moisture on your hair. As a result, your hair may feel heavy and it lacks volume. It becomes super soft and loses its natural volume. This makes your hair look thin and sticky. You find it difficult to manage your hair and to style your hair. If you make an up do hair style, like a bun, your hair will slide off from under the pins. This is because your hair becomes extremely soft and less manageable. It also makes your hair stiff. 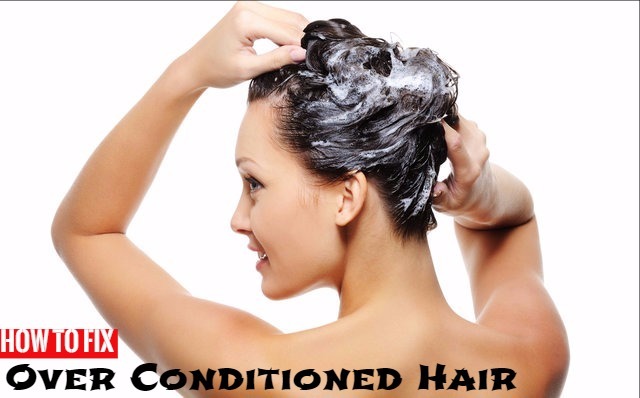 Greasiness is one of the signs that you are using the conditioner in excess. It makes your hair and hair roots oily. It can also make your hair dirtier. Your hair will look soft and shiny when you use conditioner. But if you use it more than the required amount, it can make your hair super glossy and shiny. It also becomes stickier. When you over condition your hair, your hair becomes extremely soft, glossy and greasy. When the hair is greasy, you find it difficult to style your hair. You will have to spend more time on styling your hair. If you have curled your hair, the curls will not stay in place. It will lose its bounce soon. So, if you find any difficulty in styling your hair, it may be because you are over conditioning your hair. Over conditioning makes your hair roots very soft. This can make your top look flat and oily. This is because when your hair becomes super soft, the roots cannot hold their volume for long. So, reduce the amount of conditioner you use if you notice such a sign. This will help in making your hair look voluminous. How to Condition Your Hair Properly? Using the conditioner in the right way is very important. But most of us end up using it in the wrong way and we don’t even realise it. Make sure that you use conditioner after every shampoo. Do not leave the conditioner on your hair for more than one minute. Never put the conditioner on the scalp. You should apply the conditioner only from the mid length of your hair till the tip. Whatever damage has been caused till now you cannot avoid it. But you can avoid further damage to your hair by taking care to apply conditioner in the proper way. Make a concoction of apple cider vinegar and water in the ratio 1:2. Rinse your hair with this once in a month. The concoction should contain 1 part of apple cider vinegar and 2 parts of water. You can also use a clarifying shampoo alternatively. The most important thing to keep in mind is to shampoo your hair in the right manner. This helps in washing off any residue and product build up from your hair. This helps in giving you hair that is shiny and healthy. Avoid using leave-in conditioner after you rinse off the conditioner you have used. Do not use hair styling products very often. So, although it is essential that you condition your hair, do it in the right way. This gives you lustrous and smooth hair. Take the right amount of conditioner and use it on your hair. This way you can avoid over conditioning and have healthy hair.